A3dsViewer 1.8 version was been released by AptaGraphis. Three.js version updated: 63 => 65. Enable/Disable server side gzip compression. If you are hosting your models with Google Drive the page size decreases about 30-50%. How to set up web tracking code click here. 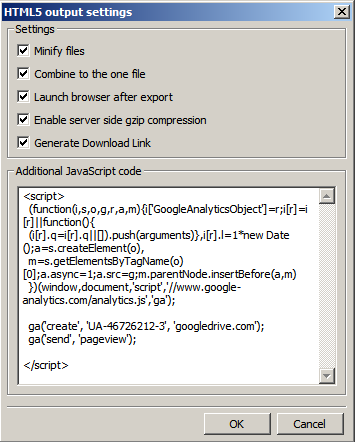 Simply paste Google Analytics tracking code to HTML5 output settings dialog. Possibility generate download link of the 3D model zip package.